Bookings for the workshop sessions can be made via the calendar below. 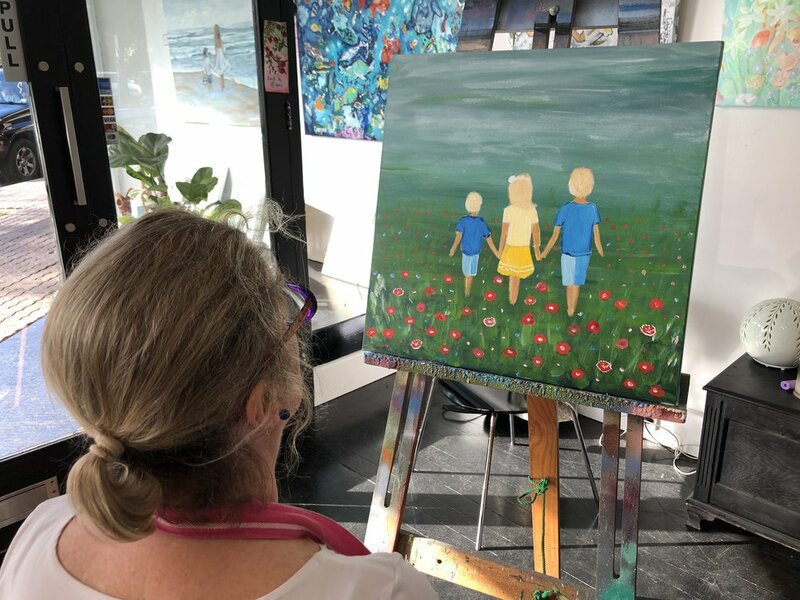 The workshop will be an experience that is time for you to unwind by painting and creating, and for you to come away with an original artwork using only artist quality materials. Workshops include all the materials I would normally use to create my paintings except a canvas. The paints, inks, mediums and sprays are predominantly Matisse and of very high quality. You will need to bring along your own canvas which you can purchase at any of the art shops. I highly recommend Art Smart in Seaforth or Eckersley’s who offer good quality student clean-edged canvases. The size is entirely up to you however a 70cm x 70cm or 60cm x 70cm is a great size to have your artwork completed in the workshop. I want this to be an experience in which you come away with an artwork that is entirely yours and where I provide guidance and assistance with creating your vision throughout the whole process. You are welcome to use any of my images as inspiration or to bring along your own ideas and inspiration. The day will include a coffee, tea, hot chocolate and cake. All you need to bring is some lunch. Bottled water will also be readily available. The day will run between 10am and 3pm. At the end of the day, you will leave with a wonderful sense of accomplishment and a beautiful, original painting ready to hang on your wall! Although experienced painters are welcome, no painting experience is necessary as I will guide you through the complete process. Workshops will be held in my new Studio 573 Sydney Road, Seaforth. I look forwarding to meeting you and enjoying a special day painting together. Discover the inner artist while spending time with your friends, family or work colleagues. BYO your favourite bottle of wine, uncork with a glass of wine in one hand and a paint brush in the other. After just a few hours of socialising you will be amazed at your work of art. At the end of the day/night, you will leave with a wonderful sense of accomplishment and a beautiful, original painting ready to hang on your wall! In these workshops we will work on a small canvas and I will demonstrate as you paint, taking you through the step by step process. We will all work on the same composition however you will be given the opportunity to personalise your own work by putting in your own children/pets/ideas. All painting materials will be supplied including a canvas (approx 50cm x 40cm), paints, inks, mediums and sprays, all of which are of very high quality. This workshop is perfect for social gatherings, Girl's night out, birthday party, hens party, anniversary party, bridal shower, fundraisers and corporate team-building workshops. A minumum of 8 participants is required. Cost is $80 per head. Workshops will be held at 573 Sydney Road, Seaforth. No skills needed in this step by step painting experience!